This week at the Convention on Conventional Weapons in Geneva, states have held their deepest and richest deliberations to date on the concerns over autonomous weapons systems. Some speculate that autonomous weapons systems are “inevitable,” yet at this week’s second meeting on the matter, no nation said it is actively pursuing them and only Israel and the United States indicated they are leaving the door open for the future acquisition of such weapons. France and the United Kingdom both explicitly said they will not pursue such autonomous weapons systems, but neither indicated support for the logical conclusion of a preemptive ban. The need for meaningful or adequate or another form of “human control” has been central to the debate with the majority of states speaking in support of retaining it. The concept is not about finding or building a “better” or “safer” autonomous weapon system but about drawing the line to prohibit systems that do not come under human control. 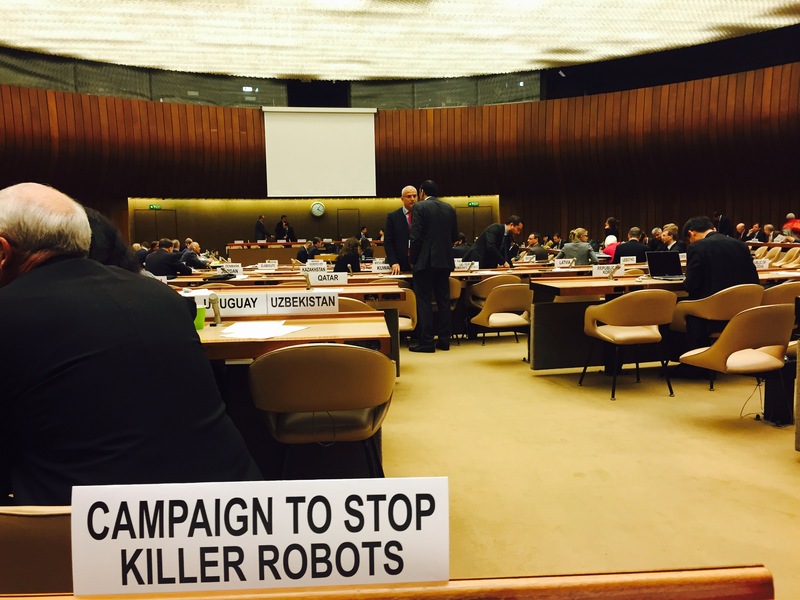 After holding four days of discussions in 2014 at the Convention on Conventional Weapons on this topic and five days of talks in 2015, the Campaign to Stop Killer Robots believes it is time for states to step it up and commit to a more formal process aimed at achieving a concrete outcome. Don’t let technology overtake the slow diplomatic pace of the CCW. At their annual meeting on November 13, states should agree to establish an open-ended Group of Governmental Experts that formalizes the work, gives it an outcome objective, and dedicates more time—three or four weeks of deliberations — over the course of 2016. Deliberations on autonomous weapons systems should not be limited to considering transparency measures or article 36 weapons reviews, as several nations have noted. While potentially positive steps to prevent the development of killer robots, these actions alone are not nearly enough to deal with the multiple challenges posed. The campaign hopes to see the CCW focus on the concept of meaningful human control and, flowing from this, a preemptive ban on the weapons. It should consider the security challenges raised, including potential proliferation. There is clearly interest in considering the legal questions relating to both international humanitarian and human rights law. That includes the accountability gap and the Martens Clause. At their Fifth Review Conference of the Convention on Conventional Weapons in late 2016, states should agree to a negotiating mandate and achieve a new protocol in two years or less. This would be the most far-reaching achievement for the CCW ever, with the greatest positive impact not only on protection of civilians, but also on how wars are fought and the way in which we think about our collective humanity.